Ranka spoke with Vedran Vasiljevic after the second round. Ranka: Please tell us about your go career. 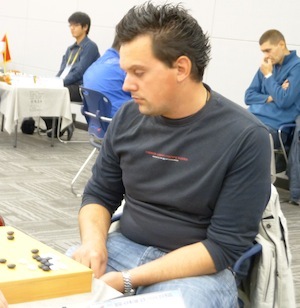 Vedran: I’ve been playing for about ten years. A high-school friend taught me, in Rijeka. In the beginning I made very quick progress, but then I didn’t have enough time to play constantly or enough money to go to tournaments. Rijeka is the world’s third biggest carnival town, and one of the activities at the Rijeka carnival is playing go, so I used to go there. I’ve also been to two European Go Congresses: in Villach in Austria, and Groningen in the Netherlands. Ranka: What other tournaments have you played in? Vedran: I’ve played in various smaller tournaments: Trieste in Italy, Bled in Slovenia, Belgrade in Serbia, Zelenkovac in Bosnia. Compared with them, there are a lot of stronger players here at the Korean Prime Minister Cup, and the organization is better. I needed some time to get used to Korean food, but now I like it. I also like Korean culture. Korean people are always very open and very ready to help strangers. They’re always smiling. And in Korea, compared with Croatia, everything is so big! Ranka: What is your goal for this tournament? Vedran: I would like to get at least two wins. Note: Vedran got his two wins in the next two rounds against opponents from Chile and Azerbaijan, and then added a third win in the last round against the player from Morocco. Well done!